Aristotle was first to divide the living world into animals and plants, a division that still enjoys popular usage: animals moved and plants did not. There are 300,000 to 315,000 species of land plants (embryophytes), which include flowering plants, conifers, ferns, and mosses, but not algae and fungi. All land plants arose from a single type of green algae, the carophytes, which made their first appearance on land 1.2 million years ago. Many green algae live on the edge of ponds and lakes, which are subject to drying. Darwin’s theory of natural selection suggests that those algae that adapted and lived above the water line survived when the water receded. Such early land plants, which appeared some 450 million years ago, enjoyed the benefits of greater access to bright sunlight and carbon dioxide—conditions that favored the generation of organic molecules to feed themselves by photosynthesis—as well as nutrient-rich soil. Seed plants, which represent 85–90 percent of all land plants, appeared 360 million years ago, followed by flowering plants, 140 million years later, and the most recent major group, the grasses, some 40 million years ago. Green plants vary from small weeds to giant redwood trees. All have eukaryotic (nucleus-containing) cells and cell walls composed of cellulose, and the vast majority derive their energy by photosynthesis. The first seed plants were the now-extinct seed ferns. Seeds consist of an embryo—a sperm-fertilized egg—and its food supply surrounded by a protective coat; such seeds can remain dormant for years after their release from their parent plant. Some 12,000 years ago, humans in many parts of the world began to cultivate wild seed plants, transforming themselves from hunter-gatherers to farmers. Seed plants are the major sources of our food, as well as fuel, wood products (absent from seedless plants), and medicines. Seedless plants, which include ferns, mosses, liverworts, and horsetails, do not grow flowers or grow from seeds. SEE ALSO: Algae (c. 2.5 Billion BCE), Eukaryotes (c. 2 Billion BCE), Plant Defenses against Herbivores (c. 400 Million BCE), Seeds of Success (c. 350 Million BCE), Gymnosperms (c. 300 Million BCE), Angiosperms (c. 125 Million BCE), Plant-Derived Medicines (c. 60,000 BCE), Agriculture (c. 10,000 BCE), Photosynthesis (1845), Darwin’s Theory of Natural Selection (1859). Land plants vary in size from inconspicuous weeds to giant redwood trees. Since the moss depicted here have no system for transporting water through the plant, they require a damp environment in which to grow and must be surrounded by liquid water in which to reproduce. 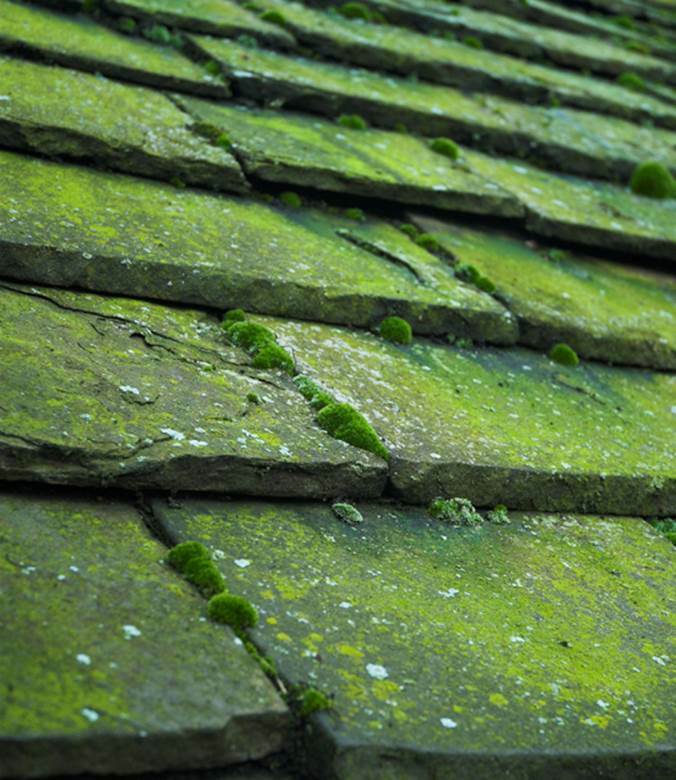 These roof tiles, which retain moisture in a rainy climate, are ideal.